In memory of all EMI staff and the people of Hayes who lost their lives in the defence of our freedom. 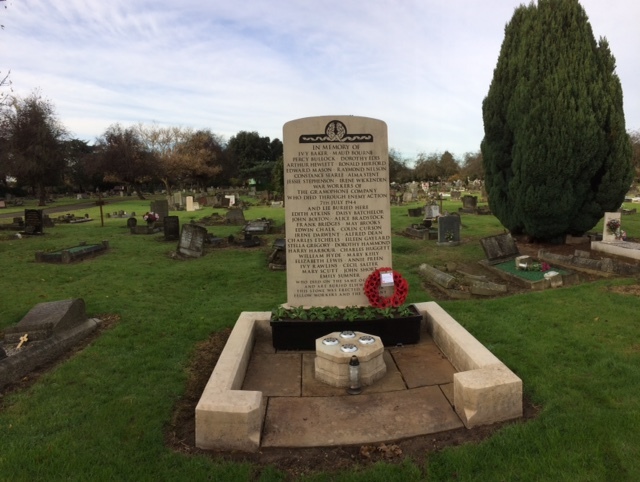 The EMI memorial, Cherry Lane Cemetery, which is both a grave marker and commemorative stone for 37 workers from The Gramophone Company, Blyth Road, Hayes killed when a V1 flying-bomb hit a factory surface air-raid shelter on 7 July 1944. Restored by EMI Archive Trust in 1994 by and again in 2009.